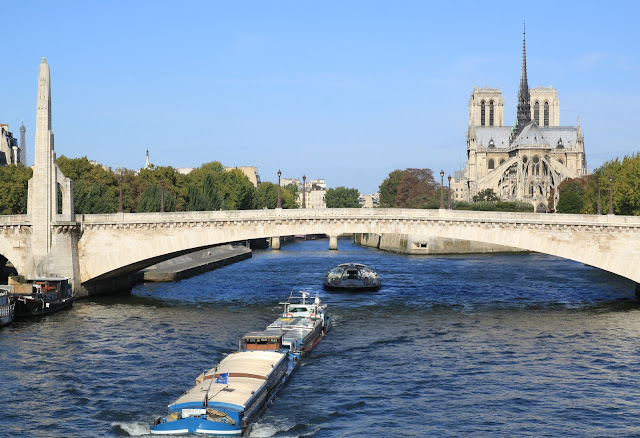 If there's one thing that really ties this city together, it's the bridges that punctuate the Seine from one end of Paris to the other. The River that Runs Through It may be the star of the movie, but the best way to get up close and personal to her is to get on The Bridge that Runs Across It. I regularly pass all but a half dozen of those in central Paris. But some of them are simply not very noticeable and photogenic, and I have no pictures at all. Others are glorious, and I can't stop snapping photos. Pont de la Tournelle with Pont de l'Archeveche in the background, and the Pont au Double in the way back. Standing on Pont de la Tournelle for the shot of Notre Dame. Pont de l'Archeveché on the left, and the Pont Saint Louis behind the trees near the right. On Pont de l'Archeveché, with the pedestrian rust-colored Pont au Double in the distance on the left-hand side of the photo, leading to Notre Dame. Same bridges, almost the same spot, taken from below, with one of the hundreds of brides I've seen down here. It's a brides and bridges photo. These particular bridges are the traditional first day of photo spots for our girls. Not only are they stunning settings, they're also great metaphors for the passage from one grade, one year, to another. On the left, ages 6 and 8, heading to their first day in school in Paris just after we moved here. They're standing on Pont de Sully, and Pont de la Tournelle is in the background. 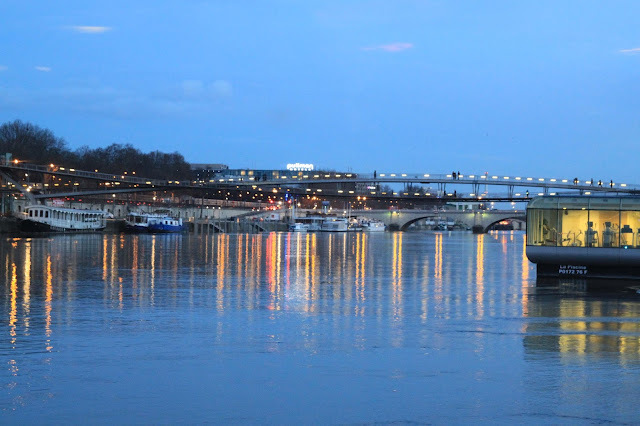 On the right, it's from two years later, standing on the Pont de L'Archeveché. Pont Saint Louis, which our family calls the pont piéton (pedestrian bridge) between the two islands. We also call it our front yard, and the girls grew up dancing and performing with the buskers on this bridge, the Hotel de Ville in the background. For four years, we overlooked the Pont Saint Louis. Here's one of my favorite sunset shots (no filter, no color adjustment at all. The world literally looked that golden yellow with the naked eye). Pont Neuf, here standing on the Pont au Change. 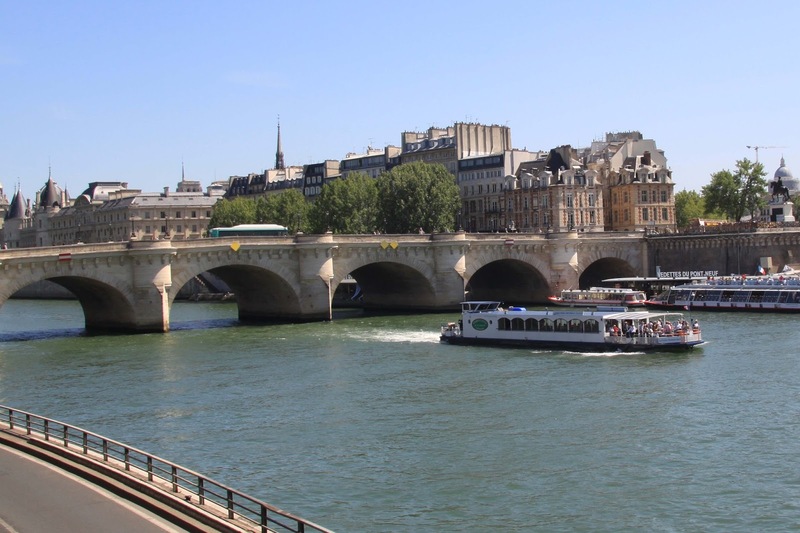 Pont Neuf, which means New Bridge, is the oldest bridge in Paris, built from the end of the 16th century to the beginning of the 17th. It was, at the time it was built, the newest bridge in the city, of course. 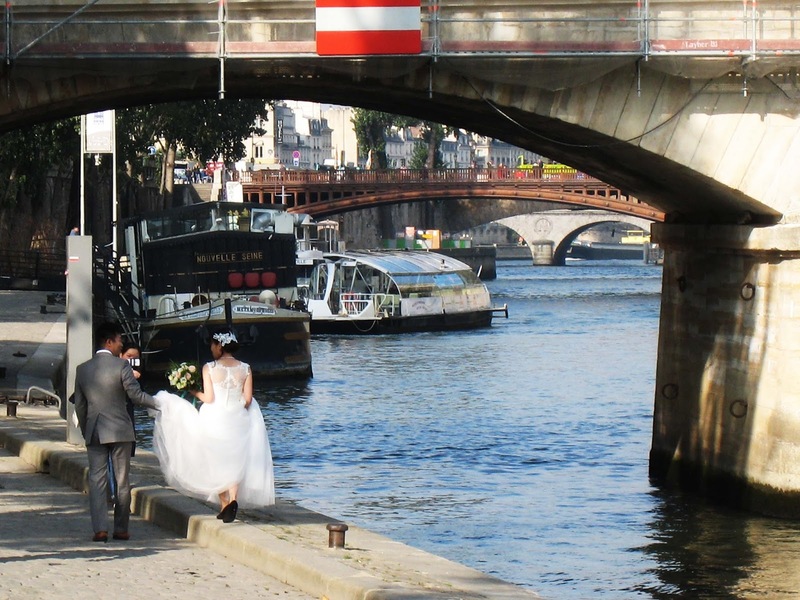 More than that, it was a new style for the bridges -- solidly made with stone, no medieval style wooden colombage houses on top of it, and even places for people to get out of traffic and sit and enjoy the view of the river. 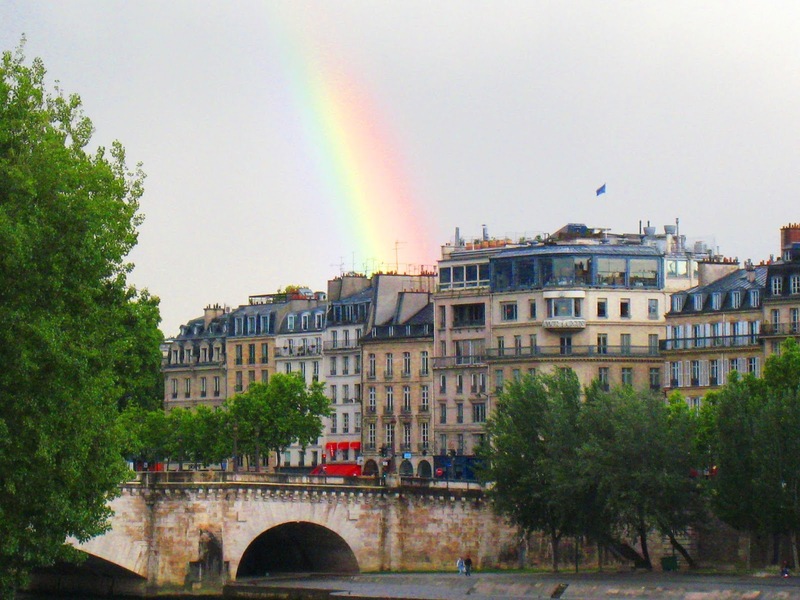 It was a new concept and, obviously, a very popular one, since most of the other bridges of Paris follow these same precepts. And here from the right bank. And here looking backwards -- that is, from the West towards the East. These photos are taken before and after the new railings were put up. In the first you see some love-locks. But this was years ago. Then, the locks got worse and worse and became quite the eyesore as well as a safety hazard. They literally added tons of weight to the rails, which started to peel off, occasionally. It's a beautiful bridge at night, too. 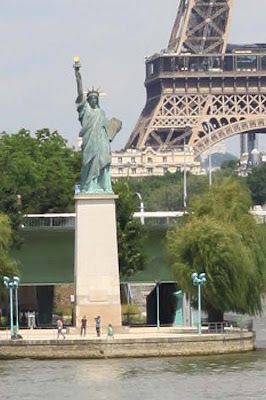 Under the bridge, just behind the Statue of Liberty, you can sneak in a little work-out. On our very first day living in Paris, we take this photo on the Pont des Arts, with the Pont Neuf behind us. The girls are much bigger now, and the locks have fist multiplied then been removed, but other than that, not much has changed: we still stop to appreciate the beauty every time we cross the Seine on one of Paris's many -- many -- bridges. 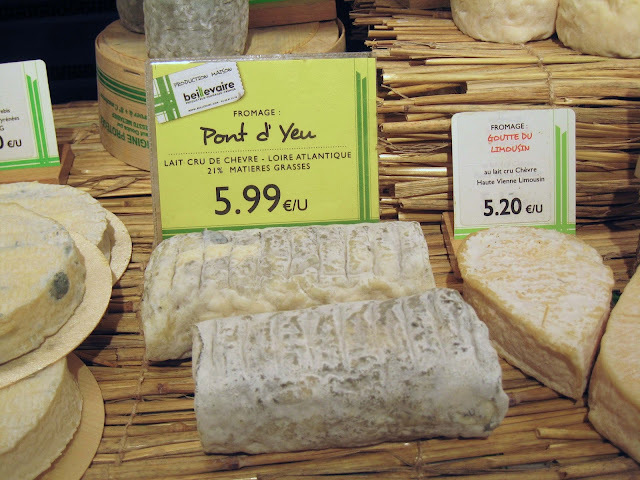 Pont d'Yeu is a raw goats' milk cheese from the Loire-Atlantique department in the Pays de la Loire region. It's also known as La Bûchette de Pont d'Yeu for the obvious reason that it's in the form of a bûchette, a little log. It's made on the Ile d'Yeu, which used to be connected to the mainland by the natural Pont d'Yeu, a land bridge that's now only visible and accessible at very low tide. It's a splendid, magnificent cheese with a gorgeous ashed crust with colorful Penicillium molds. Because of the environment, with the Atlantic all around on this tiny island, the molds here have adapted to highly salty conditions. The resulting cheese has a lovely salty finish with "sweet" style molds, instead of the stinky-feet orange molds that develop when cheese is purposefully rubbed with salted water. The cheese bursts with flavor, aged for 2-4 weeks. And the texture matches the flavor -- bursting and beautiful. The cheese is named after the Pont d'Yeu -- not a man-made bridge but rather a millions-of-years-old natural phenomenon, whereby the Ile d'Yeu connects to the mainland at very low tide via a huge land bridge. 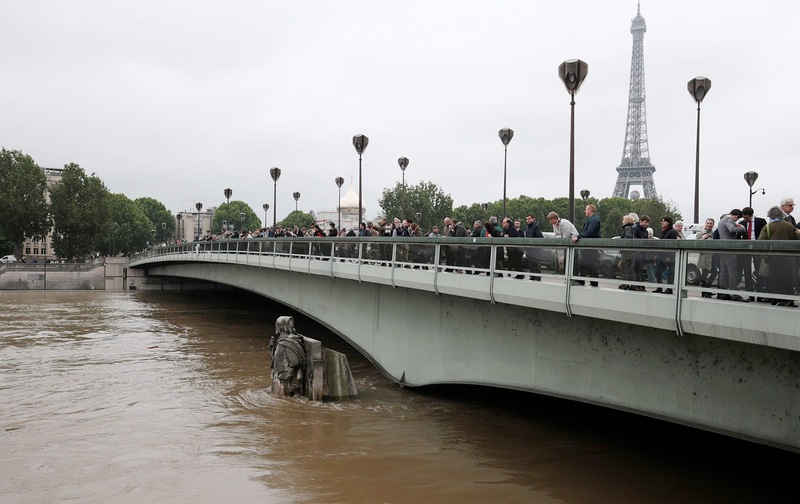 Not one of Paris' bridges is natural, or nearly that old. But to talk about all the beautiful bridges of Paris, mon Dieux, it has to be Pont d'Yeu cheese!